The Hashimoto Zebrafish Embryo Recovery System automatically gathers large quantities of zebrafish embryos. 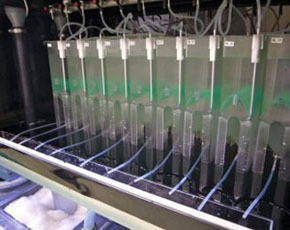 Compared to manual collection of zebrafish eggs or other breeding techniques in the research marketplace, the Hashimoto Zebrafish Embryo Recovery System leverages a 60 tank configuration with superior technology to recover 8,400-10,000 eggs/day. Embryo Isolation: Built in net automatically separates eggs from adult zebrafish with gravity and water flow pumping the eggs to the egg collecting container. The container collects the eggs from multiple tanks in one location. Collection Success Rate: Up to 90% in a 60 tank system with average daily collection of 8,400 to 10,000 embryos. Cleaning: Built in water treatment unit pumps water through a purification aquarium with filter and UV germicide lamp. Feeding: Manual feeding but leftover food and waste are cleaned via the built in water treatment unit.